Snow that shut down South arrives in Maine | Bangor Daily News. Crews work to repair power after New England storm | Bangor Daily News. 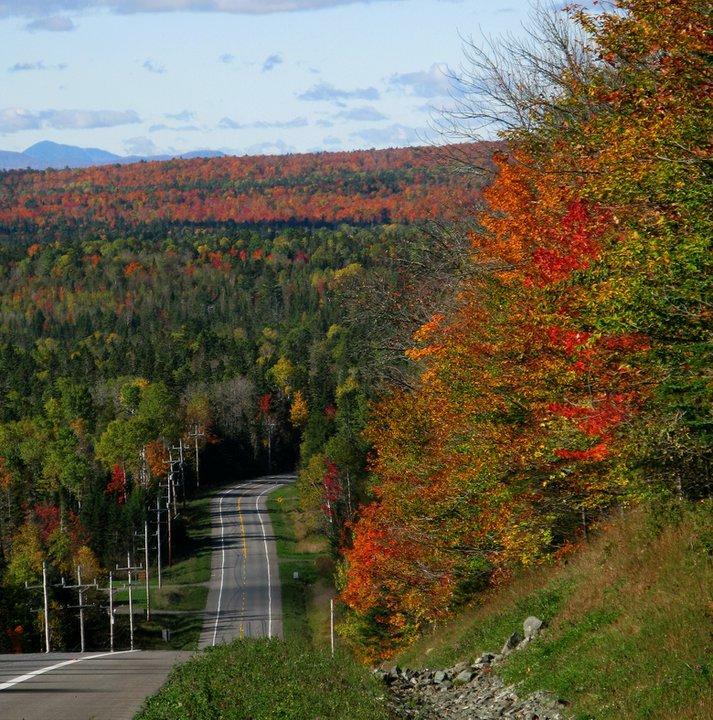 Thousands flock to New England this time of year to catch the changing colors at its peak. 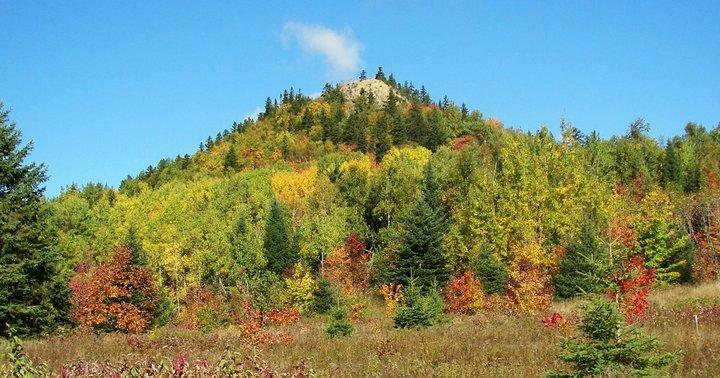 In the North Woods of Maine, the peak has already come. 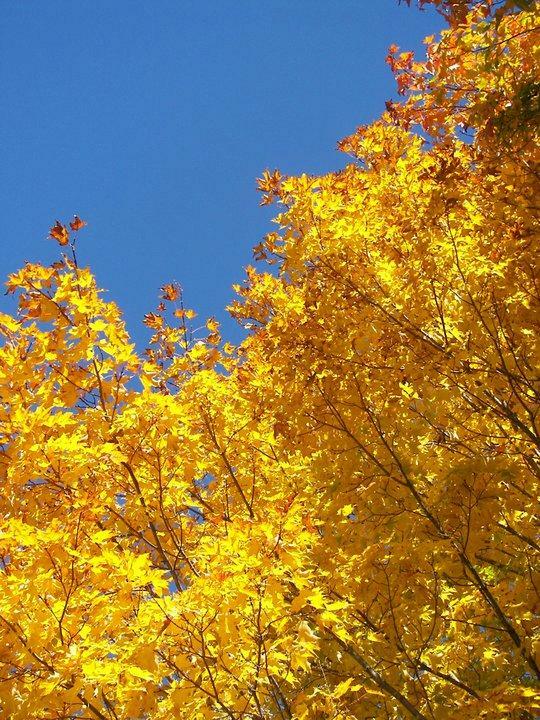 I love the yellow leaves against the brilliant blue sky in the first photo. It’s wonderful. The other three photos are a reminder of my youth. 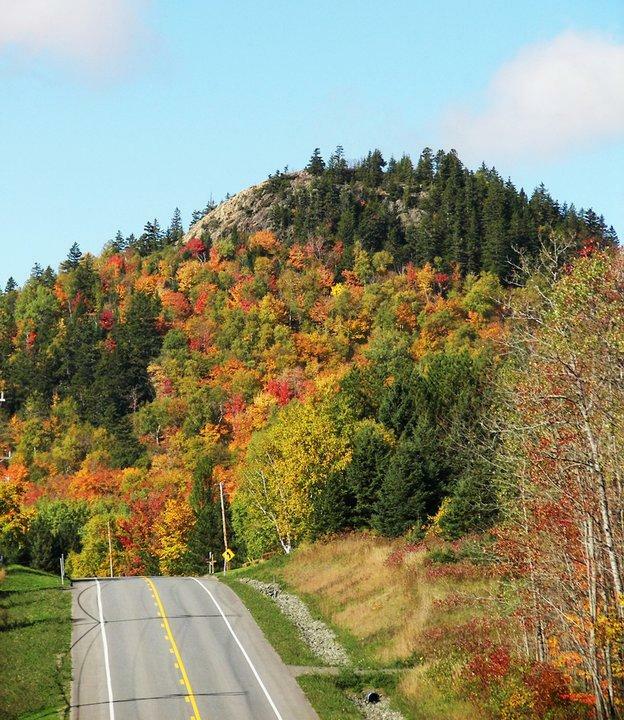 Haystack Mountain – not much of a climb, really – is located along the road from Ashland to Presque Isle. I lived in Portage, but went to middle and high school in Ashland. Presque Isle was the largest city in the area and the location of grocery stores, movie theaters, and other services, so we drove by Haystack Mountain a couple of times a month. And we usually climbed to the top every other year or so. A high school teacher, Lynwood McHatten, told his students of a time when he was a teen and boys would go to the top of Haystack to set old tires on fire to give the impression that the long-dormant volcano was coming alive. It was good for a laugh. The educational system in this country is letting down a lot of people. A guy in empresso just now commented on my hat – Boston Red Sox cap – and I said that I had grown up in New England. For crying out loud, people! New England and the Atlantic states are the R&D labs for this experiment called the United States of America. It is a hugely important part of this country. Maine getting more funding for broadband | The Portland Press Herald / Maine Sunday Telegram. The whoopie pie has made it to the West Coast! But Mainers had it first! Extolling the benefits of heating with pellets | The Portland Press Herald / Maine Sunday Telegram. Everyone knows that there are many old things in New England. So, it should not come as a surprise that the first American warship to fly the “stars and stripes” comes from New England, specifically Kittery, Maine. Today’s DownEast.com trivia question has a certain I-have-not-yet-begun-to-fight feel to it. What was the first warship to fly the stars and stripes? The Ranger was launched at Kittery under the command of Captain John Paul Jones on May 10, 1777. Whoopieeee! A recent discovery at Trader Joe’s leads to tasty Maine treat. I’m in a whoopie pie-induced buzz just now! And I LIKE it! 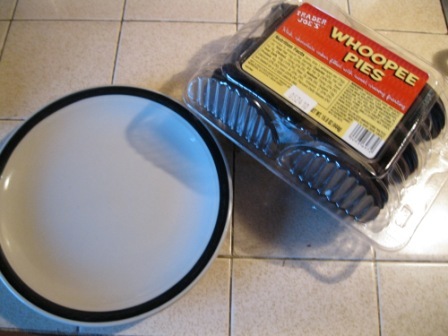 2) I just stumbled across www.whoopiepie.org, which includes historical information, recipes, and even video! For those of you who have never had a whoopie pie, I am sorry. Sooo, very sorry, because whoopie pies are wicked good. You missed out on a deliciously sweet treat – usually two soft, cake-like cookies with a creamy white filling. Yes, a sugar rush of the grandest kind. Of course, there are variations on the combination. I’ve had whoopie pies with pumpkin cookies, oatmeal cookies, and even chocolate chip cookies. And the fillings can be peanut butter or maple, too. 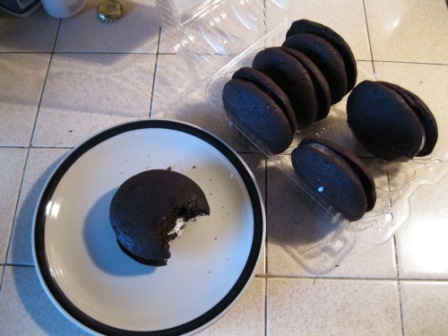 The Trader Joe’s Whoopee Pies were the basic chocolate cookies and white filling. Whoopie pies are most definitely a Maine and New England tradition, and there’s even a small whoopie pie industry thriving in New England. Small bakeries ship whoopie pies all over. 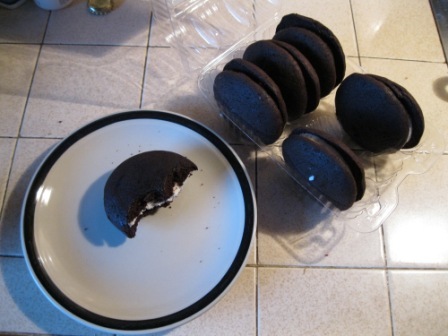 Whoopie pies are considered a New England phenomenon and a Pennsylvania Amish tradition. They’re one of Maine’s best known and favorite comfort foods. 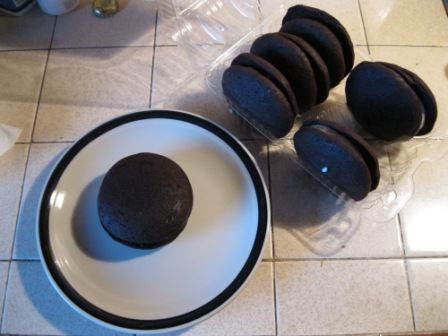 People living in Maine often claim that they were weaned on whoopie pies. These treats are more like a cake than a pie, as they are generously sized to be about the side of a hamburger patty. 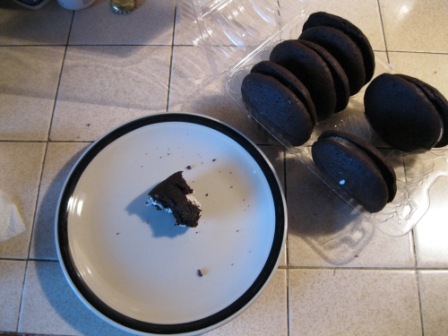 To eat a whoopie pie properly, you need a glass of milk. The Pennsylvania Amish may get credit for developing the dessert, but I don’t know about that. It’lls always be a Maine delight to me. The whoopie pie history on www.whoopiepie.org indicates that the treat was made with leftover batter and that the Amish children would yell “Whoopie!” when they found the dessert in their school lunches. I pretty much did the same thing in past years when my family has shipped whoopie pies for Christmas. 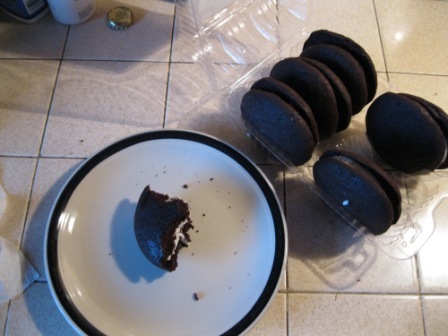 So, I had to take some of Trader Joe’s Whoopee Pies home yesterday and give them a taste test. Frankly, I seriously thought I would be disappointed, but I was not. The cookie was moist and fudgy and the filling sweet. 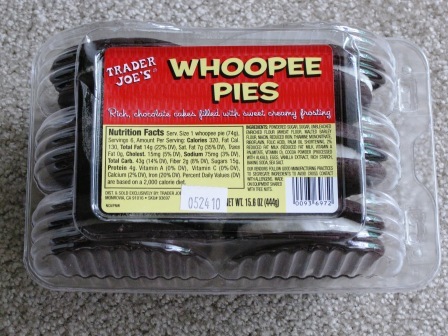 I can confidently endorse Trader Joe’s Whoopee Pies as being, well, very close to the real thing. As the photos prove, I finished off one. 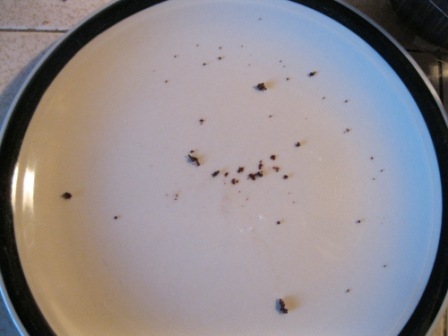 The photos do not show that I also finished off a second whoopie pie. 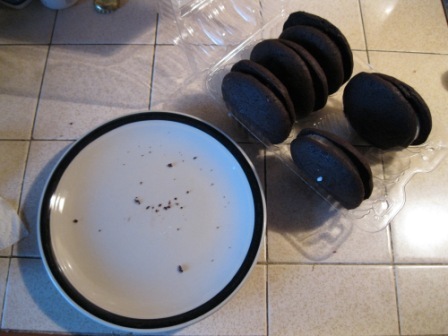 The website warns that eating whoopie pies requires a tall glass of milk. In most cases that is true. But red wine also works. Trader Joe's Whoopee Pies are home and on my kitchen counter. I can hardly wait ... so I didn't. Container is open and the plate is at the ready. On the plate. It won't be long now. Hmm, another bite. It's not bad at all. I'm busy! Don't bother me when I'm with my whoopie pie! See? Nothing but crumbs. Time for a second whoopie pie. Community colleges freeze tuition again | The Portland Press Herald / Maine Sunday Telegram. A nonprofit health agency says that all six New England states are among the top 10 healthiest states in the country, Forbes.com reported today. But New Englanders probably knew that. Vermont took the No. 1 spot in the latest annual ranking by United Health Foundation, which Forbes.com pointed out is funded by insurer UnitedHealth Group. The rankings are based on 22 health indicators, including vaccinations, obesity, smoking, and cancer deaths. And details about each state can be found on the foundation’s website, but the website is not for the patient and some of the links in this entry may be sluggish. By comparison, my current home state of California ranked No. 23, and neighboring states Oregon ranked No. 13; Arizona ranked No. 27; and Nevada ranked No. 45. CNNMoney.com senior writer Tami Luhby today posted a report that much of New England – including Maine – missed being placed on a pretty unfortunate top-10 list – the top 10 states facing fiscal peril. OK, so the story was about the top 10 and not on how much of New England missed making the list, but it is true that much of New England did miss making the list. The bottom half of the story also makes a pitch for more federal stimulus money going to states because the federal government did not realize the severity of the nation’s economic problems when the Recovery Act was passed in February. The story reports on a Pew Center on the States’ analysis of the 50 states’ current fiscal situation based on several criteria – loss of state revenue, size of budget gaps, unemployment and foreclosure rates, poor money management practices, and state laws governing the passage of budgets. My current home state, California, tops the list and neighboring states, Nevada and Oregon, also are on the list. Rhode Island is the only New England state on the top-10 list. The online story also has interactive maps to show the percentage of unemployment and the percentage of foreclosures in each of the 50 states. Rhode Island, according to the maps, has 13 percent unemployment and a 7.57 percent foreclosure rate. Of Rhode Island Luthby wrote: “The Ocean State has among the highest unemployment rates in the nation and among the highest foreclosure rates in New England. High tax rates, big budget deficits and a lack of high tech jobs are hurting its chances to pull out of the doldrums. State government has a poor record of managing its finances.” There is also a link in Luthby’s story to a previous story about the Rhode Island government avoiding closing down, never a good thing for a government. By the way, California’s unemployment rate is at 12.2 percent and the foreclosure rate is at 10.81 percent. Nevada is at 13.3 percent and 15.62 percent, respectively. Interestingly, Nevada is the only state on the top-10 list that had a positive revenue change in the budge year – it was up 1.5 percent. I grew up in Maine’s timber belt. I suppose that is much of the state, but I am talking about Aroostook County. And I have heard that high-tech firms are moving up from Massachusetts. So, I was also interested to look at Oregon, which also made the top-10 list, because it also has a timber industry and high-tech jobs. Oregon’s unemployment rate is at 11.5 percent, but the foreclosure rate is a pretty low (comparatively speaking) 4.99 percent. Unfortunately, revenue change for the Oregon government is at -19 percent and the budget gap there is at 14.5 percent. I am sure these numbers make most people’s head swim. And I know they won’t help anyone pay their bills at the end of the month. But people can look at them simply to compare where their states and regions stand compared to the rest of the country. Maine and much of the rest of New England may not be in a great place just yet, but there are a few places worse – Michigan, California, Nevada and the rest of those states on that top-10 list. Maybe optimism born from that fact will help seed economic growth in New England.